With warmer weather soon upon us, it’s time to start thinking about outdoor living. Whether you have a large covered patio or small balcony, nothing beats sitting outside with a refreshing drink, relaxing, and enjoying time with friends and family. To get ready for these spring and summer days, you need the right furniture. Here’s what to consider when selecting high-quality furniture that will make the perfect addition to your outdoor space. As you decide which pieces of outdoor furniture you’ll need, consider your lifestyle. Do you enjoy alfresco meals, or do you prefer to just lounge outdoors in the good weather? This may help determine whether you need a full patio set or a few seating pieces, such as a sofa and/or lounge chair. Next, consider your outdoor space. A large space may be able to fit a full dining set, while a smaller area may need something more compact such as a bistro table. If you have a tight space, you may also want to consider purchasing outdoor furniture pieces that are part of a larger collection. That way, you can buy some essentials now and add pieces as needed. When choosing an outdoor decor style, it can be hard to decide what you want. 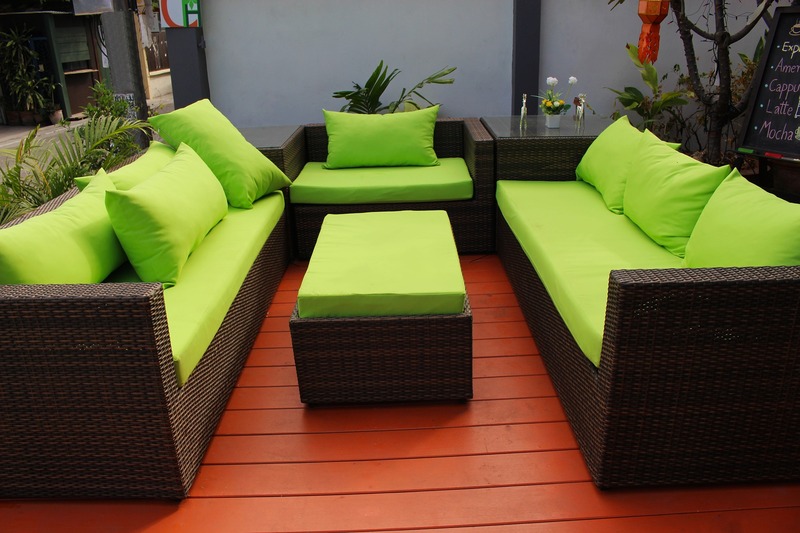 After all, outdoor furniture is different than indoor furniture, especially regarding construction and materials. First, look at the type of furniture you have indoors. Is your style ultra-modern, or do you prefer a more classic look? Let your indoor furniture aesthetic guide you as you choose your outdoor pieces. Keep in mind that many pieces are so versatile that they can easily transition from indoor rooms to outdoor spaces. Next, consider how you’ll decorate the space. 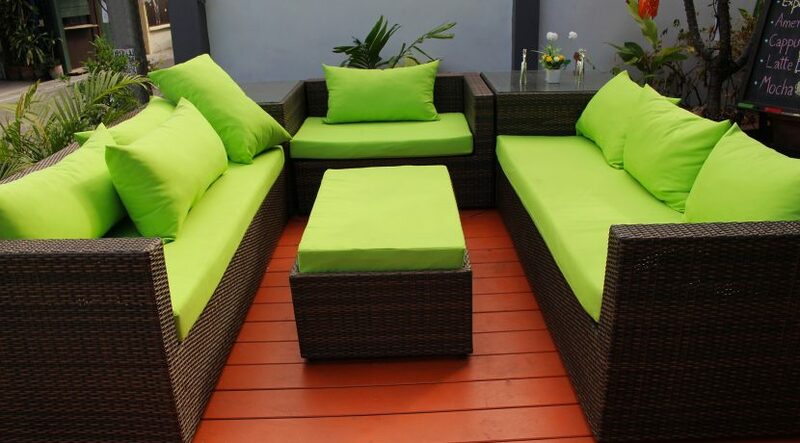 For a serene outdoor area, you may choose furniture with blue seat cushions on resin wicker frame. Furniture for a contemporary space might include sleek, metal pieces with crisp white cushions. Your outdoor area is the perfect place to take some design risks, such as adding bold punches of color with chair cushions. Metal: Whether you opt for aluminum, stainless steel or wrought iron, metal furniture brings a modern look to outdoor spaces and is both practical and versatile. Aluminum furniture is lightweight and easy to move from place to place, while wrought iron can withstand even the harshest of elements. Metal options are rust-resistant, an especially important consideration for areas that receive steady rainfall throughout the year. Teak: Wooden teak furniture is a favorite for a reason. Designed for all-weather use, teak does not bend or warp over time, making it a worthwhile investment for patio furniture. While teak is designed to withstand the elements, you’ll need to apply a teak sealant every year to retain the wood’s natural brown color and to keep it free from water stains. Or opt for a more hands-off approach by letting teak develop its signature silvery patina and natural weathered look over time. Furniture Covers: No outdoor furniture set is complete without appropriate furniture covers. Even pieces made of weather-resistant materials such as resin wicker can benefit from added protection during the cold and wet months. Covers help protect furniture to ensure years of use. Protective covers are especially important for furniture made out of wood, as wood is more susceptible to water damage than synthetic materials. Many companies sell covers for specific collections to provide a perfect fit for your outdoor furniture pieces. When choosing your patio furniture, think about value. While resin or teak may have a higher price point, pieces made of these materials will likely last longer than less expensive options. Go with outdoor furniture that will last for years to come, and that you think will work best for your everyday life. The time you spend outdoors will be all the more relaxing and enjoyable.